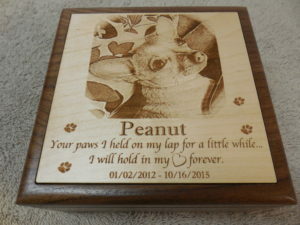 Laser engraved wooden Pet Urns create a memorial keepsake of your loved best friend. From keepsake pet cremation urns to the traditional pet urn for cats, dogs, bunnies, birds and other beloved companions, we can fill your need. You provide me with your favorite photo of your pet, tell me what you would like to say on the urn and I’ll take care of the rest. I suggest you contact me first so I can evaluate the photo you want to use, to make sure it is of good enough quality for laser engraving. I sell on my Etsy.com store. Please contact me and I’ll create a custom order for you. I hope I can ease your loss today. All of my cremation urns are customized especially for you. No two are ever alike, with your pets name, photo, favorite saying or prayer, each one can be personally customized to your specifications. They make a wonderful, sweet memorial to keep with you always. Often, at the loss of your pet, it is too emotional to even think of what to do with the ashes. Later you may regret that you did not cremate your loved one so you could have a memorial in their honor. 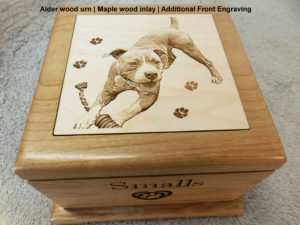 This is OK, my personalized laser engraved pet urns can be used with or without ashes. You can simply put, a collar, tags or simply a letter in the memorial and then seal it. This is a wonderful way to remember your little one even if you no longer have the ashes and are looking for something beautiful to preserve you dear pet’s memory! ** Image quality directly affects the outcome of the photo-engraving process. I suggest you click the “ask a question” link, attach your photo to the conversation and I can evaluate the photo before you purchase. *Please do not reduce the size of you photo before sending. * If you are scanning a photo to send, scan it on “Photo” or “high” resolution and send it as it is saved. * Digital camera photos usually work best, especially if taken on high resolution. * Cell phone photos sometimes are of the quality needed, sometimes not. I will tell you if you photo is not adequate for engraving. Please inquire before purchasing.